Polish nationalists use anti-Semitic rhetoric while protesting in New York City against bill to help Holocaust survivors reclaim property. 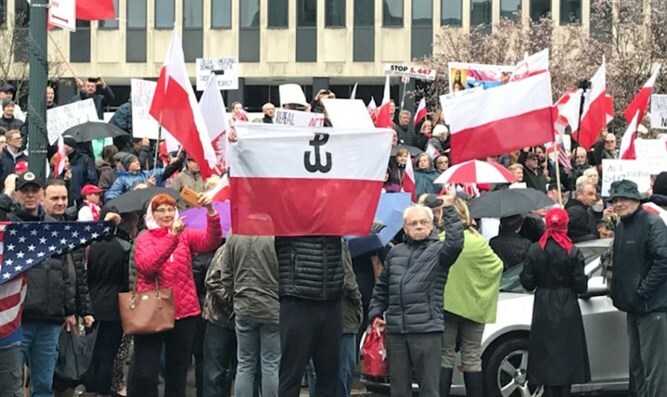 Polish nationalists protested in New York City against a bill designed to help Holocaust survivors and their descendants reclaim lost property in Poland. Hundreds of people participated in the protest on Sunday in Foley Square and some employed anti-Semitic rhetoric. One protester held a sign calling to the “stop Holocaust industry,” while others questioned how many Polish Jews were killed during World War II, according to author Molly Crabapple, who posted photos from the event on Twitter.